Shop till you drop at Harrods and Camden Market. Do some cultural sightseeing at Westminster Abbey and Victoria and Albert Museum. Next up on the itinerary: admire the masterpieces at National Gallery, take in the architecture and atmosphere at St. Paul's Cathedral, brush up on your military savvy at Churchill War Rooms, and race across the water with a speed boat tour. For more things to do, reviews, maps, and other tourist information, read our London online trip maker . Curitiba, Brazil to London is an approximately 18.5-hour flight. You can also do a combination of shuttle and flight; or do a combination of bus and flight. The time zone changes from Brasilia Time to Greenwich Mean Time, which is usually a 3 hour difference. In July, London is a bit warmer than Curitiba - with highs of 26°C and lows of 15°C. 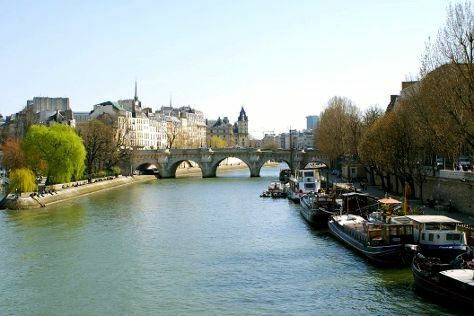 On the 24th (Wed), you'll have the morning to explore before heading off to Paris. Museum-lovers will get to explore Musee d'Orsay and Louvre Museum. Île de la Cité and Cathédrale Notre-Dame de Paris are good opportunities to explore the local culture. There's still lots to do: make a trip to Eiffel Tower, take in the architecture and atmosphere at Basilique du Sacre-Coeur de Montmartre, take a stroll through Montmartre, and tour the pleasant surroundings at Ile Saint-Louis. For traveler tips, reviews, and tourist information, read our Paris holiday builder tool . Take a train from London to Paris in 2.5 hours. Alternatively, you can fly; or drive. The time zone changes from Greenwich Mean Time to Central European Time, which is usually a 1 hour difference. While traveling from London, expect somewhat warmer days and about the same nights in Paris, ranging from highs of 30°C to lows of 18°C. Finish your sightseeing early on the 27th (Sat) so you can travel back home.